Keanu Reeves may have revealed the coming of two new Matrix films, according to an anonymous source. Some Matrix fans were unhappy about where the franchise went after the amazing original movie. They shouldn't give up on Neo yet, because according to an unconfirmed report the Wachowskis are already preparing two new Matrix films that they hope will be just as impactful as the first. A student that calls himself "El-Nino" wrote to AICN saying he attended a Q&A session with Keanu Reeves at the London School of Performing Arts. At the Q&A, Reeves spoke of various future projects, including one that will see him return to the Matrix universe as Neo. El-Nino writes that Reeves divulged he met with the Wachowskis (creators of The Matrix) at the end of December 2010 for lunch, and they told him a "two picture script treatment" that would see Reeves reprise his Matrix role was already completed. The Wachowskis also said they've been trying to determine if the films should be shot in 3D through discussions with Jim Cameron. 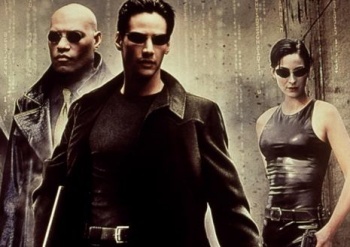 Reeves seems excited about the possibility, and mentioned he feels he has an "obligation" to Matrix fans to return to the franchise in these new sequels that he believes will "truly revolutionise the action genre like the first movie." If El-Nino's information is sound, the Wachowskis will begin more serious talks on bringing the sequels into production after completing work on the film adaptation of Cloud Atlas. None of this information has been officially confirmed, so take it with a grain of salt. It certainly sounds like something Reeves might reveal to a cozy Q&A group he didn't think would post his words on the internet, though. Update: It's looking like this rumor was a complete hoax. The Senior Administrator for the London International School of Performing Arts told ScreenRant that Keanu Reeves never made an appearance there. Reeves' rep also said that the story is a fabrication. Too bad, I would have liked to see the franchise revived.